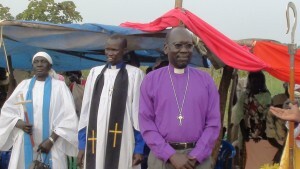 The Bible constantly provides image, narrative, symbols, assuredness, and promises as the crucified Churches in South Sudan continue to grow in unutterable suffering. It is always an honor and great privilege to share with you the stories of my journey every time I had opportunity to visit South Sudan. The heart-rending stories in the country which has endured years of savage wars and now wrestling to find meaning of their precious young born nation which they achieved its independence with the help from many friends such as you—“a voice of voiceless” has a lot to be praying for. Landing in Juba International Airport on Thursday, May 31, 2012 with a direct flight from Dulles, Washington DC to Addis Ababa, Ethiopia, and to a dusty capital city of South Sudan was a great thanks to God because there never been any international trip that has direct connection with that region before. I don’t really remember if it was tarmacked then, but what I remembered there was a single terminal building without concourse that typically serves all of the functions. I landed and find three friends of mind who were waiting in extremely hot weather-sweating profusely. There was no shuttle airline connection bus, so we took a few minutes’ walk to that small congested building where wrestling was the only mean to find what you want or where to go (no organized queue). It took me one hour plus to get my passport stamp and to collect my languages. Although the trip from United States to South Sudan took me about 20 hours I was still look sharp and fresh, but entering into that small congested building I became exhausted, weary, and sweating profusely; and the clothes I wore also creased. Since there were no stanchions positioning, the rule of “first come first serve” doesn’t work, thus yelling at each other was so common, and, even at some point some folded their fist or took law into their hands for being pushed so hard or stepped on foot. So landing in Juba, then, was a bit irritating but no blame, the country is just starting from the scratch-Every development always starts at that very humble stage and grow overtime. Whenever I visit and see how Christians are so committed in serving the Lord Jesus in such a profound suffering I recalled what Archbishop of Canterbury George Carey said during his visit to Juba in 1995 when he was welcome by a crowd estimated 86,000. In his word, “If there is one thing that stands out in our experience of the Sudanese church, it is that even though the problems are enormous, the wounds so deep, still Sudanese love and praise their God. Perhaps it is truly because, ‘God is only strength and hope, a very present help in trouble.’ …If our first impression of Sudan may be tragedy, our last impression are of the triumph of Christ crucified and raised from the dead.’” That was truly a correct observation because Sudanese Churches flourish as problems are intensified—knowing that the only help in such unutterable suffering is having faith in God. 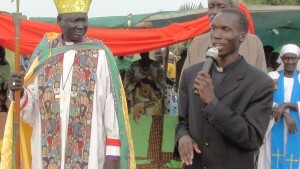 The dedication of St. Paul, the church of which God used me to plant during my first visit: 2010- 2011, was described by it congregation residing in Yei, Central Equatoria as “God (Nhialic) has seen our suffering and send His Servants to restore our hope.” The ceremony was attended by Archbishop of the Anglican Church South Sudan, Most Rev. 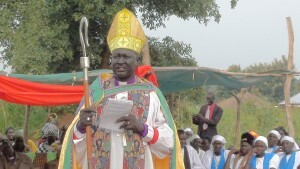 John Machar Thon, bishop of Rumbek, Rt. Rev. 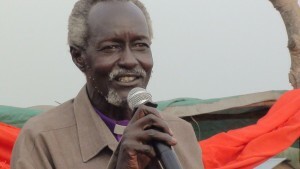 Moses Ater Pagarau, and bishop of Akhot, Rt. Rev. John Machuei Ater; and many clergies representing many churches, chiefs, and representatives from various government branches. The estimated crowd was over 4000 with youth and children population surpassing the ceremony’s attendees. “Let us give thanks. Let us give thanks to the Lord in the day of devastation, and in the day of contentment. Jesus has bound the world round with the pure light of the word of his Father. When we beseech the Lord and unite our hearts and have hope, then the jok (evil) has no power. God has not forsaken us. Evil is departing and holiness is advancing, these are things that shaken the earth.” Translation was by Marc Nikkel (Land of Promise, pp. 70-71). Even though pressing needs such as food could be the first thing that one could expect in speeches of desperate populations who are internally displaced from their home towns due internal conflict and force to live in such places where they neither receive relief, nor practice their traditional life of farming-leave alone having job. The best selected orators recalled the striking features of the country’s political trajectory where they have been deprived of rights and privileges by their ages-archenemy (Arab). In their words, “We have been killed, slaved, forced to recant our Christian faith to be Muslim, forced to embrace Arab norms and cultures instead of ours, deprived of education as a mean of keeping us marginalized. Our dominant have been intentional poised us to bear diseases knowing that we cannot find treatment because no clinics…’We don’t want our children to go under such terrible ordeal as we have been. Tell our Christian friends in America that please help us, we need your support: we need schools and clinics.”’ The speeches were emotional, some even cries as frail and elderly despondent quiver words of dismay. 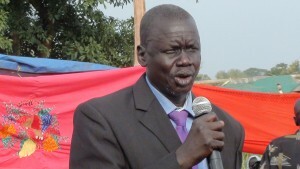 The disadvantages young generation in South Sudan called themselves a “chosen generation” a name coinage by Lost Boys from Sudan as God’s chosen generation to serve Him. It was taken in (1 Peter 2:9) “But you are a chosen generation, a royal priesthood, a holy nation, His own special people, that you may proclaimed the praise of Him who called you out of darkness into His marvelous light; who once were not a people but are now the people of God, who had not obtained mercy but now have obtained mercy.” Christianity in Sudan especially South was first received by young generation who left their parents behind to worship their ancestral or traditional gods and they embraced new God known as in Dinka language Nhialic. This young generation becomes role model in shaping Christianity in the way more understandable to their parents. Their time is entirely spent in the church’s activities as many of them who lost parents used to say, “God is our father and mother, and church is our home.” They don’t have schools, they don’t have jobs-they just live to fight another day. But their faith and hope in God never waver because the Bible assured them that “Be faithful unto death and I will give you a crown of life” (Rev. 2:10). And this unshakeable faith proved right the observation of the former Archbishop of Canterbury, George Carey, …even though the problems are enormous, the wounds so deep, still Sudanese love and praise their God…” For it is out of the harsh, dry soil of war, loss, and oppression that shoots of new life sprung out, thus “Death has come to reveal the faith.” Mary Aluel, in this song urges her fellow Christians to withstand the test of the time. It is requisite to conclude this with what our Lord Jesus said, “For I was hungry and you gave Me food; I was thirsty and you gave Me drink; I was a stranger and you took Me in; I was naked and you clothed Me, I was sick and you visit Me; I was in prison and you come to Me.’ Then the righteous will answer Him, saying, Lord, when did we see You hungry and feed You, or thirsty and give you drink? When did we see You a stranger and take you in, or naked and clothed You. Or when did we see you sick, or in prison, and come to You? And the King will answer and say to them, ‘Assuredly I say to you, inasmuch as you did it to one of the least of these My brethren, you did it to Me’ (Matt. 25:35-40). In the same way Paul urges us to “rejoice with those who rejoice, and weep with those who weep” (Rom. 12:15). So our prayers and supports in any form can restore the hope of these people who live in nadir of despair. 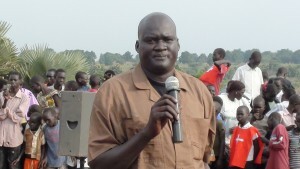 Archdeacon Peter Bol Riak urges crown to be strong in their faith and to keep unity as number one. Most Rev. 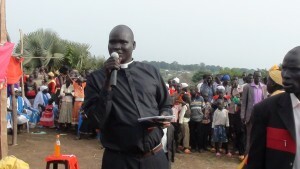 John Machar Thon, Archbishop of the Anglican Church of South Sudan urges crowd about God’s love to children of Cush-qouting Isaiah’s prophecy (Isa. 18). 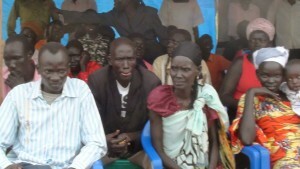 My wife, Deborah Achol Riak introducing the purpose of the ceremony- taken on July 28, 2012. 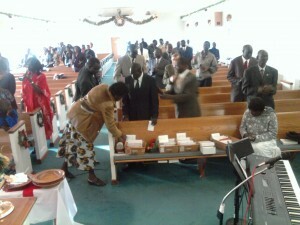 United Sudanese Christian Church congregation celebrate the birth of Christ at Cloverleaf Baptist. 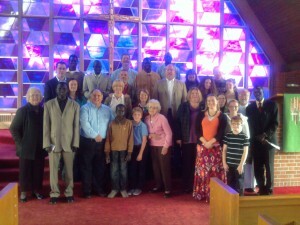 First joined service of the USCC with Resurrection Lutheran Church congregation. 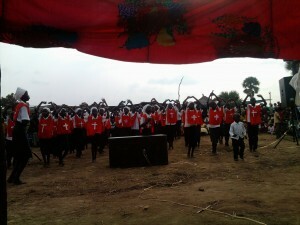 Sunday Schools entertained audience in ceremony. Stats: 43 queries. 1.027 seconds. Valid XHTML, Valid CSS, XFN. "Red Delicious" theme by Nicki Faulk.